The Baldwin Hills Estates was originally part of the 4,481.5 acre "Rancho La Cienega o Paso de la Tijera" given in 1843 by Governor Manuel Micheltorena to Vicente Sánchez as part of the Mexican land grants establishing major ranchos or settlements throughout Alta California. Cienega derives from the Spanish word cienaga, which means swamp or marsh land. Paso de La Tijera is the Spanish name that translates into Pass of the Scissors. This name was used to describe the trail that cut along the Baldwin Hills, which resembled a pair of open scissors. "Paso de la Tijera" appears in maps circa 1860 where a path crosses a stream, at the present-day intersection of Crenshaw and Martin Luther King Jr. Boulevards. The areas encompassed by the dual-named ranch are now known as Ladera Heights, Windsor Hills, Baldwin Hills, and Leimert Park. Vicente Sánchez was alcalde, or mayor, of Los Angeles from 1831-1832 and again in 1845 until his death in 1846. Upon his death the rancho was inherited by Sánchez widow Maria Victoria Higuera and his grandson Tomás Sánchez. Tomás was equally involved in the early governance of Alta California, having held positions as county sheriff and as a member of county and city legislative bodies. The younger Sánchez held control of the land until 1875 when he sold Rancho La Cienega o Paso de la Tijera to Francis Pliney Fisk (F.P.F) Temple, Arthur J. Hutchinson, Henry Ledyard and Daniel Freeman. Temple experienced financial difficulties and in 1875 Elias J. (Lucky) Baldwin acquired portions of the rancho giving his name to the hills that dominated the western section of the land, thereafter known as the Baldwin Hills. According to John Kielbalsa in Historic Adobes of Los Angeles County', the structure located today at 3725 Don Felipe Drive is the oldest surviving building in the city of Los Angeles. Kielbalsa suggests it may have been built between 1790 and 1795. In contrast, the Avila adobe on Olvera Street was built circa 1818, almost 30 years after the construction of the adobes on Don Felipe Drive, but the Olvera Street adobe retains the honor of the oldest residence in Los Angeles. 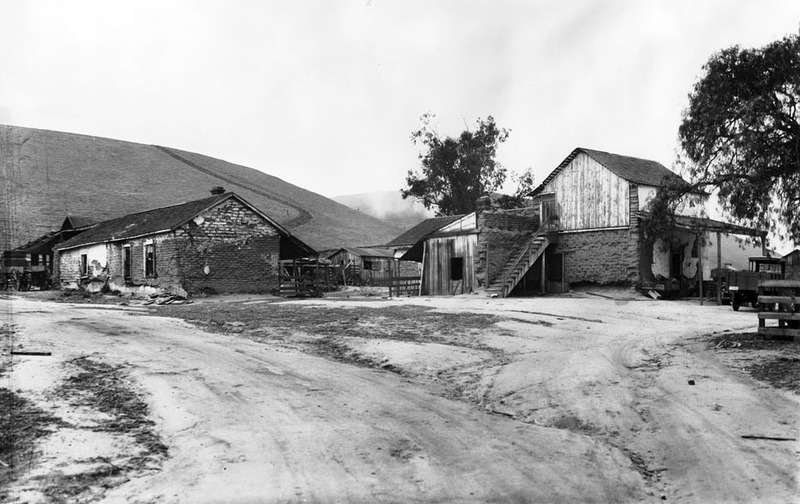 Baldwin used the ranch primarily as pasture land however upon his death in 1909 his daughter Anita M. Baldwin soon realized there was oil on the estate, and by 1916 drilling had begun. During the 1920s the La Tijera Adobe underwent several renovations. It was converted into a women’s club and later became the club house of the Sunset Fields Golf Course. The Sunset Golf Association leased the estate around the adobe from the Baldwin heirs. After World War II the area was subdivided, becoming a residential neighborhood and replacing the greens and fairways. In 1948 the May Company Department Store was completed below the hill east of the adobe. The following year the Broadway Crenshaw Shopping Center was built next to the May Company. The former rural environment around the historic adobe was finally eliminated. The development of the Baldwin Hills Estates began during the early 1950's. The primary parties included Home Savings and Loan Association Corporation, Baldwin Hills Sales Company, Title Insurance, Trust Company and trustees of Anita M. Baldwin estate. In 1946 the Thomas Brother Guide for Southern California listed no streets or landmarks in the immediate area of land between La Brea and Stocker Avenues By 1949, however, some development of streets and residences appear on the map including Hillcrest Drive, which links older residential streets to the Baldwin Hills Estates. By the early 1960's nearly all of the streets and neighborhoods in the Estates had been designed and built featuring underground utilities. The Estates are characterized by mid-century modern homes many with pools and winding streets beginning with the Spanish word "Don" (translated "sir" in English). This, according to BHE residents, is evidence of the Mexican heritage that inspired the developers. More recently several significant developments have added to the idyllic setting of the Baldwin Hills Estates. In 2014 Kenneth Hahn State Park and the Norman O. Houston Park both received extensive investment and upgrades including walking paths, outdoor exercise equipment, children’s play areas, extensive landscaping. Longer term the Baldwin Hills Conservancy, whose mission is to purchase and preserve public lands within the area, envisions connecting the various green spaces surrounding Baldwin Hills to create One Big Park. These open space recreational parks in combination with the Metro Expo and Crenshaw/LAX line expansions make life in the Estates the perfect combination of quiet living at the city's center.